It is a collection of various Juridical Studies of Kalidasa written and read for Kalidasa-Samaroha at Ujjain. These papers were discussed in various seminars in Ujjain. This volume is centered on Kalidasa and follows the lines provided by Prof. L. Stembach. The legal and allied material has been analyzed and explained with a view to come to a conclusion regarding the source use by Kalidasa. The tradition of Manu has been followed by Kalidasa in social matters. But in Political and Legal matters, Kautilya has been accepted as an authority: sometimes verbatim. The comparison of the matter in Kalidasa has been made with that of the Vedic contents, the Mahabharata, Manu tradition, Kautilya/Canakya tradition, Kamasutra, compendium of Smritis particularly Yajnyavalkya and Mitaksara, Smriticandrika Dharmakosa, other texts on Dharmasastra and a few texts of classical Sanskrit. Both the primary and secondary sources have been utilized. The writings of J.J. Meyer, Prof. P.V. Kane, Altekar, R.K. Mookerjee, Ludwik Strembach and Sontheimer were of great help to collate various sources. Kalidasa berrows from his predecessors and reproduces blends as if original. Born in 1942 at Nankana Sahib (Now Pakistan), Prof. Narang was educated in India particularly at University of Delhi. He passed his M.A. Sanskrit 1963 with record marks. He worked of his Ph.D. on the topic: ‘A Study of Sastra-kavyas in Sanskrit Literature.’ He did his LL.B. from University of Delhi in 1976. He wrote about 175 papers and published about 100 on various fields of literature particularly Kalidasa, Vedic and Sanskrit Linguisties and grammar, lexocograthy, Law in ancient India, Jainism and poetics. I have great pleasure to present this volume of Silver Jubilee Publication series of Rashtriya Sanskrit Sansthan to our esteemed readers. The publications varily represent the goodwill and cooperation, the Sansthan has all along been receiving from the eminent scholars all over the country. The Sansthan was established in October, 1970 with a view to promote, preserve and propagate sanskrit learning in general and shastraic learning in particular. With the encouragement and support from the Ministry of Human Resource Development, govt. of India, the Sansthan decided to bring out 25 scholarly monographs to commomorate its Silver Jubilee year under its Silver Jubilee Publication Series. The present volume Juridical Studies in Kalidasa authored by Prof Satya Pal Narang, Professor and Head, Department of Sanskrit, University of Delhi, briefly exposes the facts that are related to law and court, Jurisdiction, Political philosophy, taxation, terrorism and its remedies etc, found in the works of Kalidasa. I express my gratitude to Prof. Narang for gladly contributing the monograph for the Silver Jubilee Publication Series. I appreciate the services rendered by Dr. Savita Pathak, Dr. R. Devanathan and other collogues in bringing out the Silver Jubilee Publications. M/s Nag Publishers deserve our thanks for printing the book in time. It is a collection of various essays on legal aspects of Kalidasa written and read for Kalidasa-Samaroha at Ujjain. These papers were read and discussed in various seminars in Ujjain Under the chairmanship of Late Prof. Bhagvat Sharan Upadhyaya, Prof. Harihara Trivedi, Dr. S.V. Sohoni, Prof. Venkatachalam, Prof. R.K. Sharma, Prof. S.S Janaki, Prof. N.P Unni, Prof. K.K. Chaturvedi, Prof. Gautam Patel, Prof. T.S Nandi, Prof. Radha Vallabh Tripathi and other scholars during the years 1976-1994. This volume follows the lines provided by Prof. L. Stembach. The bulk of matter regarding the modem legal researches is provided by the original Sanskrit texts, Buhler, Jolly, J.J. Meyer, Prof. P.V Kane, L. Stembach, Altekar, R.K. Mookerjee, B.S. Upadhyaya, Sontheimer and other ancient Indian Jurists. 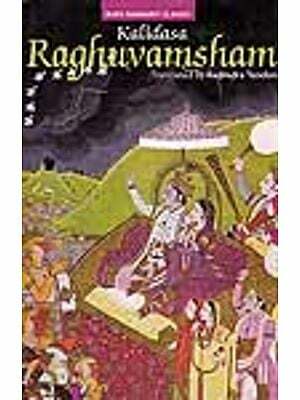 The complete works of Kalidasa have been carefully read, Roman and explained with a legal mind and view. An attempt has been made to segregate the poetic elements from the pure legal material which is interspered in his writings like nira-ksira. Poetic concepts like vara, s'apa, adhikara , pramada are to be interpreted in their legal sense and parallels. Some socio-mythological events have been explained and accepted as legal features symbolically or figuratively. Kalidasa is a serious observer of the society that is why his legal concepts are not only based on the Sruti and Smrti hut on loka and antah-Karana-pravrtti (the voice of the consciousness) as well. He has not only followed the law of Manu verbatim whom he has reffered to by name but also the law of Kautilya and social law and customs of Vatsyayana whom he has quoted In principles. The similarity with the concepts of the Mahabharata and the Ramayana is natural because they serve him as the source books for his poetry and the dramas. In this regards a few concepts of Kalidasa are not original. He has borrowed them from his predecessors (purvasuri). But these concepts appear to be as if original. He follows the customary (loka) law as well besides the sources like concepts although they are beautifully digested. The concepts of Kalidasa based on the original text are given first and the idea is corroborated by the legal/non-legal texts. An attempt has been made to come to the conclusion of each and every idea. An attempt has been made to search the legal principle content and the contribution of Kalidasa in that regard. The variants were not available at the initial stage. When the critical apparatus of Prof. Reva Prasad Dwivedi (1986) was published, I tried to check a few variants which I casually mention if the conclusions are materially effected. The Rashtriya Sanskrit Sansthan did not give me sufficient time to recheck them and to change my earlier conclusions. It can further be elaborated in the light of the material found in the Critical Edition of the Mahabharata and the Ramayana. The variety in the foot-notes is due to the fact that various papers were written in different years. The purpose of law to protect the weaker from the stronger is depicted like his predecessors. Kalidasa, as a poet, is a follower of mild type of law lest it does not irritate the public. In theory he talks of danda policy followed and codified by Manu but the comparison of the concepts shows that he follows the laws of Kautilya who was known for his strong law (in the Arthasastra) for political and commercial purposes. The words dharmastha, dharmasana, vyavaharasana and nirnayadhikara for the court also show that both the social and legal institutions were separate in the mind of Kalidasa. A number of Acaryas are quoted in the Mahabharata and the Arthasastra of Kautilya for the administration of punishment. With the comparison of the published edition of the Arthasastra attributed to Kautilya, it appears that he is follwing Kautilya in the principle yathaparddhadanda, This tradition continued in the whole of Indian thought found in the great epics, Manu and the political drama like Mudraraksasa. Kalidasa believes in the severe punishment for the repetition of the offence. Unlike the modern law where the criminal escapes under the garb of benefit of doubt in his favour, if a criminal is killed in running from the law, Kalidasa does not injunct trial after death. He died a natural death. The punishment mentioned by. Kalidasa does not necessarily found in the earlier jurists. It is sometimes, of course, corroborated by Classical Sanskrit writers like Visakhadatta, Daudin and a number of later poets. 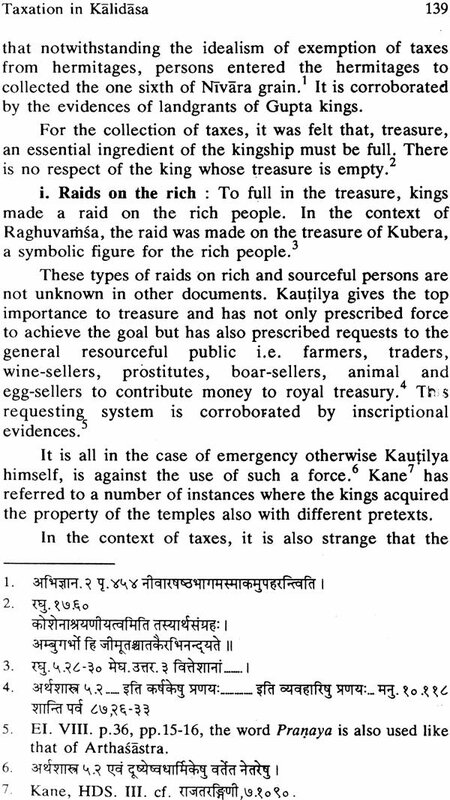 Collecting various scattered clues from the works of Kalidasa, an attempt has been made to reconstruct his concept of court-procedure which includes absconding, investigation, Hand-cuff, beating, abusing, examination of the commodities, approach to justice-hall, report of the case, hearing and order, wait for the king till he is free, sentence order, prizes and compensation, release of prisoners, imprisonment and concept of cross-examination. In this context, various investigating officers are reffered to who are found in legal texts or are the innovations of Kalidasa. A number of abuses are found which have a social relevance. It is very interesting that a line found in Kalidasa which is related to the procedure is found in the legal texts also. Sentence-order of release with prizes and compensation was on the spot. No legal delay which leads to denial of law was involved. This order could not be challenged in any other court of law. In order to keep the criminals into custody, Kalidasa has injuncted the construction of interior jail which are like the black-cells. It is in contradiction to Manu. Divine evidences are known in Kalidasa. He has referred to the favouritism in judgement also which must be avoided to come to a particular definite conclusion. A separate court of the harem is also referred to. 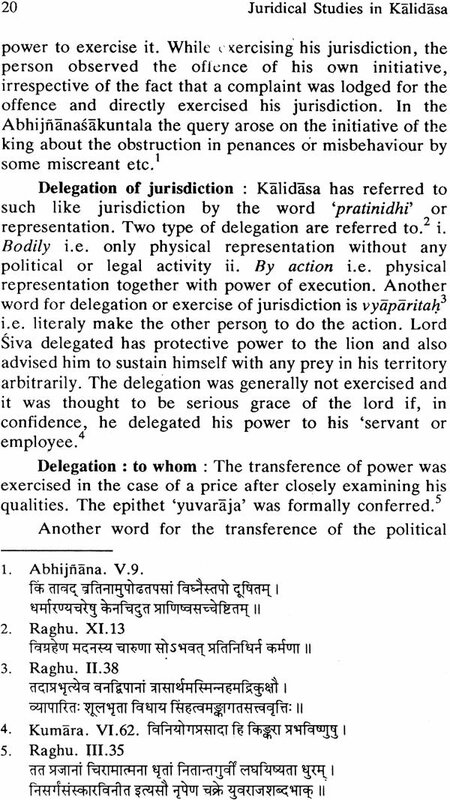 Kalidasa has raferred to Political, Social and Religious jurisdiction besides the territorial jurisdiction over the kingship and legal procedure. The concept of jurisdiction is strictly observed like the limits of the ocean. 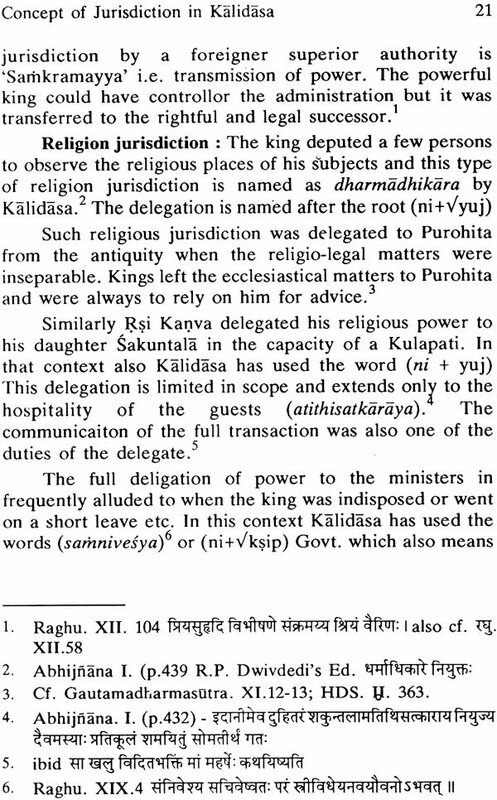 Delegation of jurisdiction both in political and religious matters is known from the works of Kalidasa. He has drawn an interesting simile from the grammatical rules where the jurisdiction with limited scope operates de facto in a few cases and not de jure. 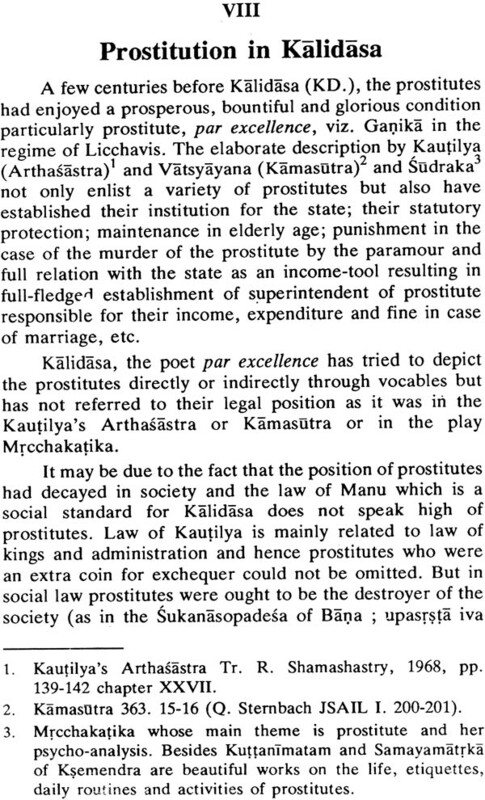 The words used by Kalidasa are interesting for the history of law because they are less used elsewhere. The protection to jungles with the local strong people (context: the lion) is interesting and is relevant in modem ages. Both limited and limitless jurisdiction for a particular purpose is also known in the works of Kalidasa. The superior foreign power could delegate the political power to the legitimate legal successor of the original won king. Nyasa has been analyzed by Kane and Sternbach in details with special reference to the Smrtis. Kalidasa's words for trust are poetico-legal where notwithstanding the fact that actual material and concepts of the Smrtis are used, its socio-poetic blend is an interesting feature. In his opinion, a bow, kingship, children, animals and even the women for their protection can be deposited. Sometimes the technical words like upanidhi and niksepa are missing from his writings. He might have borrowed the concept from his predecessors i.e. the Ramayana and the works of Bhasa who use the words nyasa. The word niksepa is also mentioned in the same sense. It appears that Kalidasa intermixes both the words and omits upanidhi. Kalidasa fully knows the legal consequences of the return of the trust and hence is anxious to return it. Kalidasa has used the concept in its poetic perspective as well. The place of deposit; non-enjoyment of the deposit, an anxiety to return the deposit and a sense of relief after its return. According to Kalidasa, it should be returned to a person who placed it and not to any unauthorized or malafide person. Like the deposits, employer and employee topic has also been discussed in details by Prof. Kane and Sternbach. An attempt has been made to search the words and their function from the writings of Kalidasa. The scheme of the classification is: the royal empolees who are put in the category of employer and the general employees including the labour class. The material is explained in the light of other texts particularly in the light of the writings of B.S. Upadhyaya and V.S. Agrawal. Kalidasa is very sympathetic for the employees and like the Arthasastra tries to establish their welfare and makes provision to provide them food at the place of their work which is a facility for their efficiency. On the other side he expects strict values from the work of the employees. He beautifully depicts the labours in the fields for agriculture and plucking the flowers. 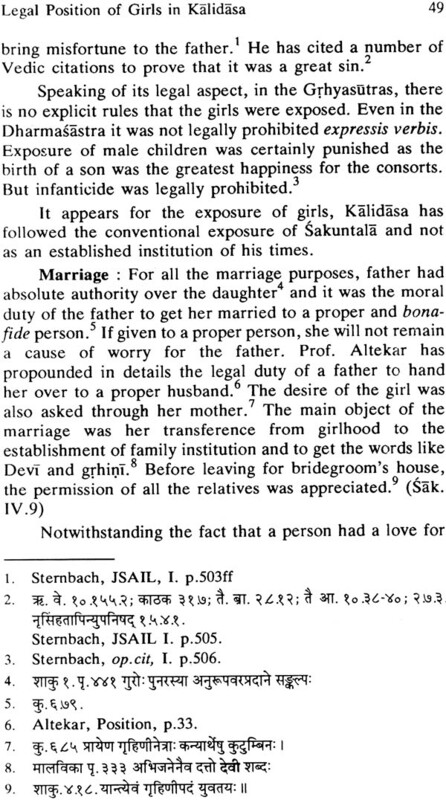 Meyer, Winternitz, Kane, Alteker, Sternbach and Son-theimer have already analyzed in details the position of girls, women, widows and prostitutes in Indian culture on the basis of the legal/non-legal treatises and historical culture in general. I was profitted by their writings. A few Classical Sanskrit texts were also used which were not used by the earlier authors. Kalidasa has shown a favouritism for the sons but in general he treats girls as a satisfaction to the parents although she has a poor status. She connot marry a boy of her choice although following the conventional theme of Sakuntala, he has propounded in details the Gandharva type of marriage. Similar is the case with regards to Virya-sulka. She cannot inherit the property. She has to make a compromise with the co-wives. For exposure of the girls, he follows the conventional theme in the case of S'akuntala. Repudiation after the marriage is a problem. Other topics discussed are: asceticism till death, Education, their dance in the temples, purda and abduction etc. Definitely the problem of Sati, Bride-burning, dowry and non-employment is not a problem of the days of Kalidasa. Besides the sources used above, there is an interesting clue of the reversion of the property to the lineage of the daughter which is not found elsewhere. It is a mythological allusion to the story of Parasurama but I have interpreted it legally. 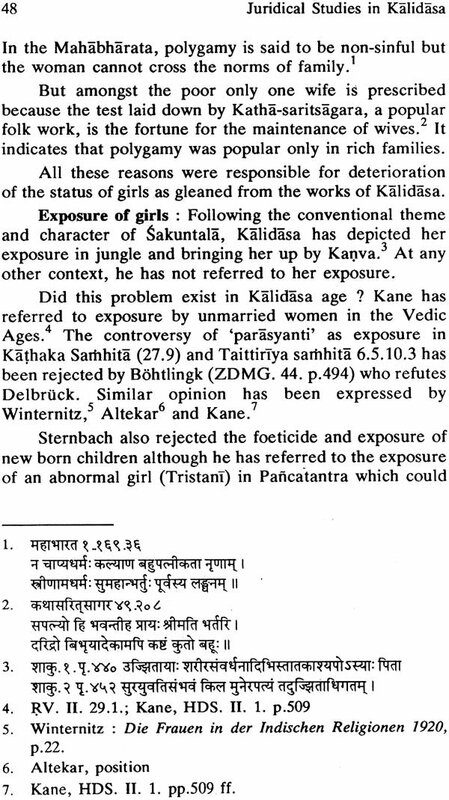 Sati institution is not clearly visible in the writings of Kalidasa. The institution of prostitution is not clearly visible in the writings of Kalidasa like that of the Kautilya and Sudraka. It appears that economically dependent women, when repudiated, were compelled to adopt prostitution. Definitely in the tribal area, the citizens of the city enjoyed the ladies in the caves in jungle in consideration of payment of money. The word Nicaih exhibits the double entendre of Kalidasa vis-a-vis Uttamastri. 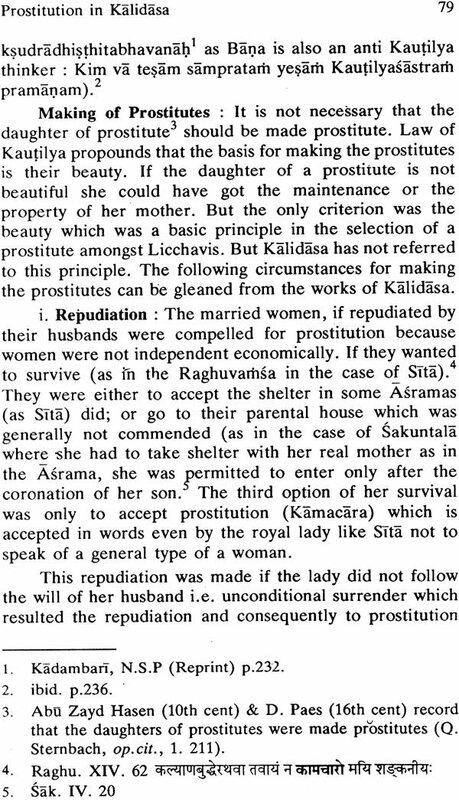 Sternbach's detail and scholarly researches with regards to the collection of words and concepts particularly with reference to Kautilya and treatises on prostitution were used by myself to corroborate Kalidasa. I added a few details to his researches. Kalidasa has given a few own observations regarding the political philosophy. He has used a number of concepts available in the Mahabharata (in formation and contradictory), Manu (25%), and Kautilya (75%). An interesting feature of his political philosophy is dvairajya which applies to modem state independence these days. For all the extent and purposes, the kings of various states are independent. It does not require a schedule or enumeration of power between the state and centre. It has no conflict of subjects inter se. Infact they are autonomous kings. Their relation to the superior authority is by virtue of relation of father and the sons. Other concepts of political philosophy are found in Manu for social subjects and in the Arthasastra for political subjects. The concept of saktis is also taken from Kautilya. Like the opinion of Kautilya quoted ij1 the Arthasastra itself, he is a follower of the doctrine yathdparadhadanda although he has also spoken of. a hard danda which belongs to Ausanas also. He has frequently spoken of the delegation of political power and arbitrators. Continuing the previous subject, the king and officials and their functions are enumerated as found in the works of Kalidasa. 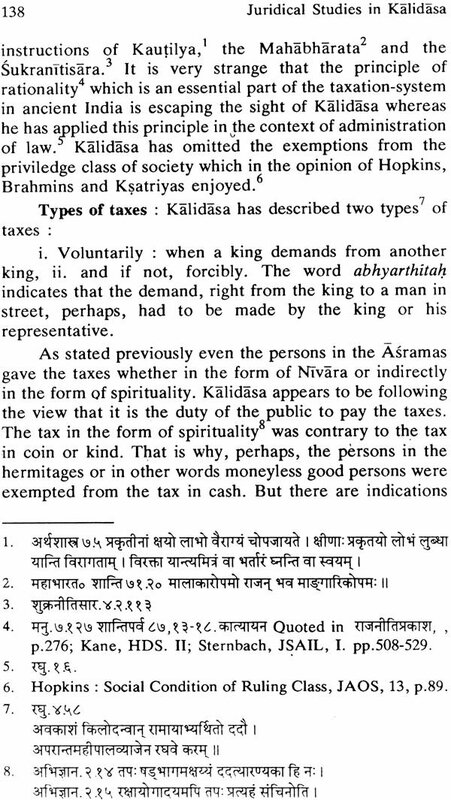 Kalidasa has frequently mentioned the taxation and a number of words for it but his principle consists of the welfare and not the greed for collecting the taxes. He has indirectly mentioned two types of taxes i. voluntarily ii. by force (like modern Income-tax raids if the assessee does not pay the tax). Various types of taxes and the controversies regarding those taxes particularly through the writings of Bhagvat Sharan Upadhyaya have been collected. It is a function of the king to suppress the terrorists from the public. Through the internal evidence, an attempt has been made to interpret indirectly as to what are the remedies provided by the poet. 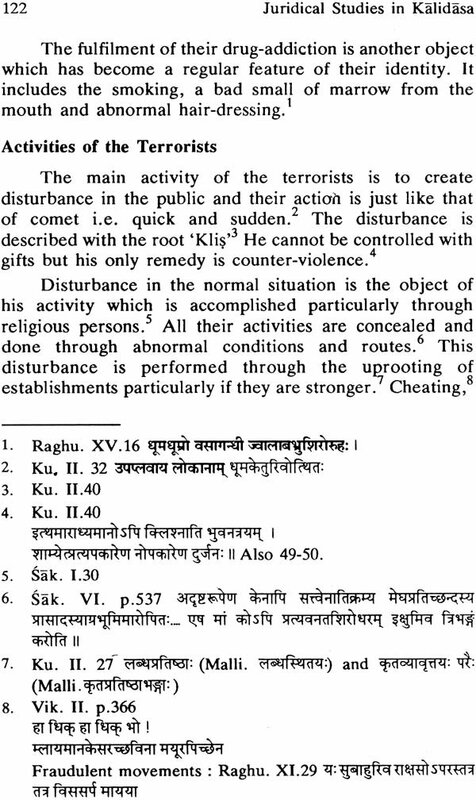 The depiction of terrorism in the Kumarasambhava is just like the modern terrorism including the hijacking and abduction. The scattered activities have been collected or interpreted from his writings. The remedies are not the exclusive duty of the king. It is from the side of the king and public. It is a joint project of the intelletuals and army. "To arrange a remedy in time" is a message of Kalidasa. Kalidasa does not negate the force against the terrorists.